The BC Rifle Association will be holding its annual 300-600 Meter F-Class and TR (Palma) Championship shoot from 30 July - 03 August 2010 at The world's most beautiful rifle range, Vokes Range. This match includes individual shooting combined with specific team matches at distances from 300 - 600 Meters. Targets are the new and challenging ICFRA standard targets. There will be teams/individuals from the US, UK and Canada. I understand that Stan, John, and the rest of Team Savage will be making the trek again. Vokes range is located aproximately 1-hour from the Canada US Border and is located roughly 90 minutes from Vancouver. British Columbia was the birthplace of F-Class Shooting, and there will be several of the Best F-Class shooters in Western Canada attending. second your comments on the 'most beautiful' range. US shooters - you can also e-mail or call me for INFO on getting across the border, etc. one important item for folks traveling across canada - you can't carry a weapon through a provincial park. for F- CLASS SHOOTERS following the BC PROV. we travel one day to PORTLAND, OR. for the PNW F-CLASS CHAMPIONSHIPS. they are all long range matches - 8,9,1000. all are 'PROPER' FULLBORE MATCHES - pair fired with convertable sighters. all matches are seperately registered for establishment of NATIONAL records. further, there is a 'grand agg.' bc and pnw combined. stay tuned for more about that match. 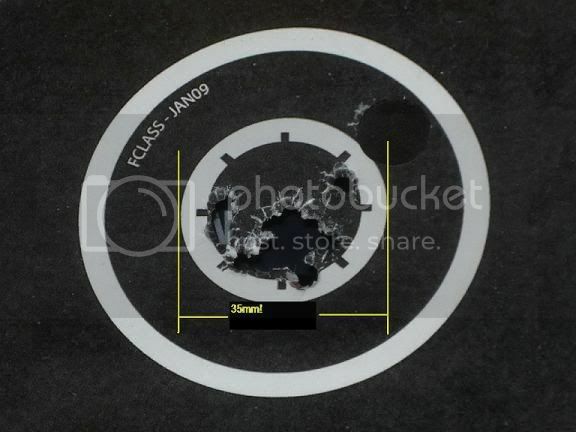 For F Class, is a 1/2 minute V-Bull patch being placed on the ICFRA target or is it the unpatched one minute V-Bull? Unless something radical changes, I'd expect the long range targets @ Douglas Ridge (Portland) to use standard USA LR-FC (1/2 moa X, 1 moa 10-ring) centers. you got that correct. - the if---- tgt is a bugger!! entries are limited top a total of 96 shooters!!! Looking forward to hooking up with you at the Prov's again! Perfect possibles still happen, as evedenced by this target shot by the '09 champ, Richard Dreger. "HABU" is also an expert on what is required to cross back and forth at the border for all you American shooters. are you folks coming down for the '600 club' shoot in NOV.??? have a number of 8# varget coming soon - anyone need some - send PM OR E- me.